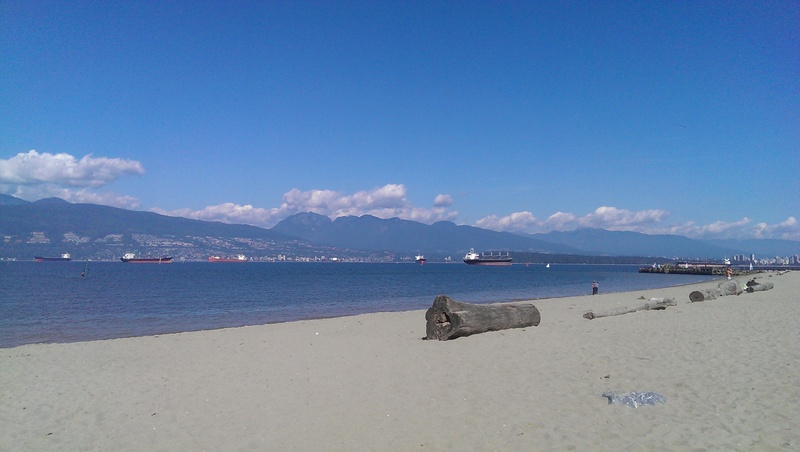 Several months ago when the sun was blessing Vancouver with warmth and summer sensations, I spent almost an hour on the beach at Locarno on the west side of Vancouver. My intention was to sit and admire the stunning view (it never gets old), but I ended up fixating on a man and his wind surfer. This guy just would not quit. From the time I arrived to the time I left, he averaged one attempt every minute. It was excruciating and exhilarating at the same time to watch him gather the sail, step onto the board, drag up the heavy boom, push off and then…splash. His wife was sitting comfortably in a chair on the beach, taking pictures. She had her camera raised – poised to catch him at the moment he sailed off into the blue and green glory that is Vancouver on a bright September day. And every minute, she lowered the camera to rest her arms while her husband gathered himself for another attack. I could see the sigh from thirty feet away. I could not get over the energy of this man. The wind blew him steadily down the beach until by the time I left he was a speck in the distance and his wife had long since given up trying to take his picture. During the time I watched him, another young man stride to the water’s edge, hefting a beautiful wind surfer that looked to be miles more high tech. He plopped the board into the water, pulled the sail up with one fluid motion, then stepped on the board and whoosh – off he went across the waves. About twenty minutes later, the sleek-suited wind surfer with his black form fitting wet suit trimmed in red that matched his sleek, form-fitting life jacket sailed back to shore, jumped off his board, ran up to the bathroom, presumably had a quick pee, and then ran back to his wind surfer, jumped back on and sailed away again. And all the while our poor hero had not yet managed to stay upright for more than a few milliseconds. It was heart breaking and heart warming. I wanted to stay until he either got up onto the board or he gave up. But I’d already watched him for a good hour. I couldn’t wait all day—I had a ferry to catch. 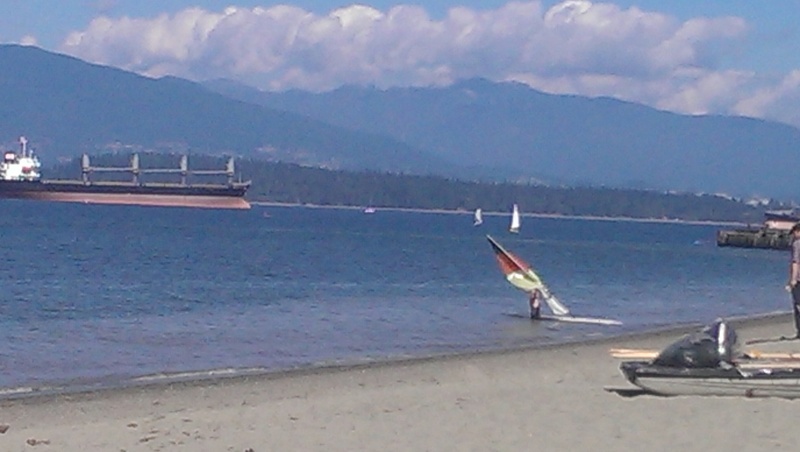 As I drove slowly away from the beach and merged into the pulsing Vancouver traffic snaking over the bridges, I mused upon the wind surfer and his tenacity. I decided that whenever I am faced with a difficult job, one that takes me longer than I want it to take or even seems too hard to tackle, I need to think of that man and his wind surfer. 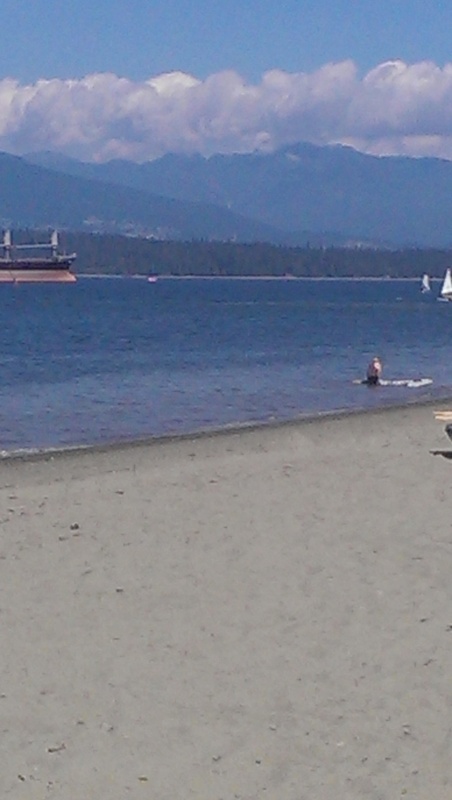 I’ll never know for sure, but I like to think that, eventually, he got up on his board and skimmed across the waves. Even if he stayed upright for only a few minutes, he would have succeeded. That’s life, isn’t it? You set a goal, you strive to achieve it, you fall repeatedly into the waves, and then, just maybe, you get what you set out to get. Or perhaps you don’t. Either way, you have looked determination square in the eye and that’s got to be worth a great deal.